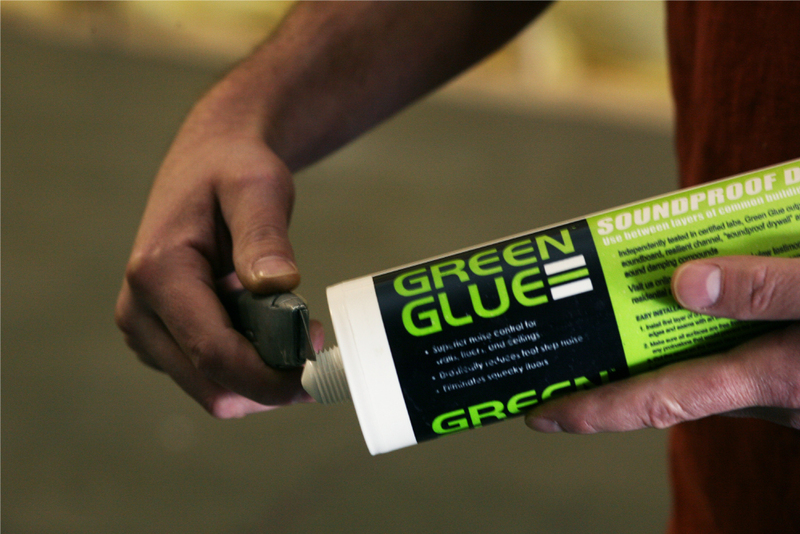 Any of the Green Glue products are easily installed in new construction or renovations. Ensure you get the job done right the first time with the assistance of installation documentation and videos. Download the guide(s) you need to get the job done. Prior to installing any of the Green Glue products, review the appropriate instructional videos that will show you the key pieces of information you will need to know. Tap your GG tube on a hard surface to bring compound away from the tip and prevent dripping. Cut a ¼ inch hole in the tip of the rube with a utility knife. Screw nozzle tightly over the tip of the tube and cut a ¼ inch hole in the tip of the nozzle. Place the tube in a standard 28 ounces caulk gun to prepare for installation. With the first layer of drywall already installed, as per local building codes, apply Green Glue Noiseproofing Compound to the back of the second layer drywall by pulling the trigger to dispense the product from the tube. Leave a 2 to 3 inch border around the panel to allow for handling. The application pattern does not matter so long as you’ve distributed product evenly across the drywall. For best performance it is recommended that you use two tubes of compound on each 4x8 foot drywall panel. Once the first tube is empty, discard the cartridge and replace with the prepared second tube and dispense onto the panel. Finishing or mudding the first layer of drywall is not necessary if you stagger the second layer of drywall to cover any seams (recommended method). Within 15 minutes of applying Green Glue to drywall, fasten the panel to the first layer of drywall, following local building codes. Leave a ¼ inch gap along the top and bottom of the wall to allow for sealing. Continue with this process until you have applied Green Glue to all desired drywall panels.